The decisions of the International Criminal Tribunal for the former Yugoslavia (ICTY), first to set free an indicted war criminal, and then to request his return to The Hague, have heightened tensions between Serbia and Croatia. EURACTIV Serbia reports. Vojislav Šešelj, indicted for war crimes during the Yugoslav civil wars in the 1990s, was freed last November on compassionate grounds, as he is suffering from cancer. The main condition for his release was that he didn’t engage in political activities. Šešelj is still awaiting a verdict for alleged war crimes, and crimes against humanity. Šešelj, who is still the leader of the Serbian Radical Party, surrendered voluntarily to The Hague in 2003. He was succeeded by Tomislav Nikoli?, the current President of Serbia. Prime Minister Aleksandar Vu?i? started his career in the same political party, a branch of which in 2008 became the Serbian Progressive Party. Nikoli? was the leader of the Serbian Progressive Party until he was elected President in 2012. He was succeeded by Vu?i? as leader, and is affiliated with the centre-right European Peoples’ Party. On 30 March, the Appeals Chamber of the ICTY ordered that Šešelj be returned to the tribunal’s detention unit from Serbia. This decision has upset the government in Belgrade, which sees it as an attempt to destabilise Serbia. On the other hand, the court order was welcomed in Zagreb, which, after Šešelj’s temporary release, had on several occasions urged the tribunal to revoke the decision. Šešelj’s behavior, and some comments from senior Serbian and Croatian officials, sparked new tensions between the two countries. Šešelj has said he will not return to The Hague voluntarily, and that he will “fight” in the event he is arrested. “I will use legal options. I will also use political means and that’s that. When they send the cavalry, army, police, gendarmerie… what can I do. I hear they’re even readying paratroopers,” said the Radical Party leader. Vu?i? stated on 31 March that no one would arrest Šešelj in a surprise raid. Government officials interpret the ICTY’s decision that Šešelj should return to The Hague as a form of foreign pressure after Vu?i?’s speech at a ceremony in Belgrade on 24 March, marking the 16th anniversary of the NATO bombing of Yugoslavia, which he called “aggression”. Nevertheless, Serbia recently concluded an Individual Partnership Action Plan with NATO, which is the highest level of cooperation for a non-member state. Vu?i? also hinted that foreign elements were trying to destabilize his cabinet, stating on 30 March that “someone, somewhere miscalculated” that Šešelj was a factor that could shake him and his cabinet up. Šešelj said that the decision of his return to ICTY detention had been made because the Belgrade regime was frightened by the sudden spike in the Serbian Radical Party’s popularity, given that provincial and local elections are to be held in Serbia late this year. For Vu?i?, the tribunal’s decisions regarding Šešelj are a delicate issue, due to potential discontent among the nationalist-oriented voters of his Serbian Progressive Party, as well as his past close ties with Šešelj. The foreign minister and leader of the smaller partner in the ruling coalition, Socialist Party of Serbia, Ivica Da?i?, said on March 30 that the ICTY decision was “perfidious and scandalous” and jeopardized the stability of Serbia and the entire region. Da?i? said that Serbia had been acquainted neither with the decision on Seselj’s, release nor with the decision on his return. Rasim Ljaji?, the head of the National Council for Cooperation with the ICTY, said that the two contradictory decisions on the same matter in just five months made cooperation with The Hague tribunal difficult and affected the credibility and perception of the tribunal among the Serbian public. Former ICTY spokesperson Florence Hartmann said the ICTY was to blame “for the circus created” in the Šešelj case. “It was logical for them to change their decision, but they should have thought about that sooner, given the way Seselj is behaving,” said Hartmann. Croatian officials welcomed the tribunal’s decision to return Šešelj into custody. Zagreb has on several occasions called on the tribunal to revoke the decision on his provisional release. “That is the least that can be done at this stage, while we have been waiting for a verdict for years. Everyone knows he is responsible for war crimes, that he is a war criminal and belongs in The Hague,” said Croatian President Kolinda Grabar-Kitarovi?. In January, Grabar-Kitarovi? urged UN Secretary General Ban Ki-moon to take all the necessary steps to ensure that Šešelj goes back to ICTY detention and that a verdict in his case is made as soon as possible. On 1 April, Šešelj burned a Croatian flag outside the Palace of Justice in Belgrade, as his response to the Croatian state officials who, as he put it, had been attacking him for a month as if they had “been hit on the head with a club”. 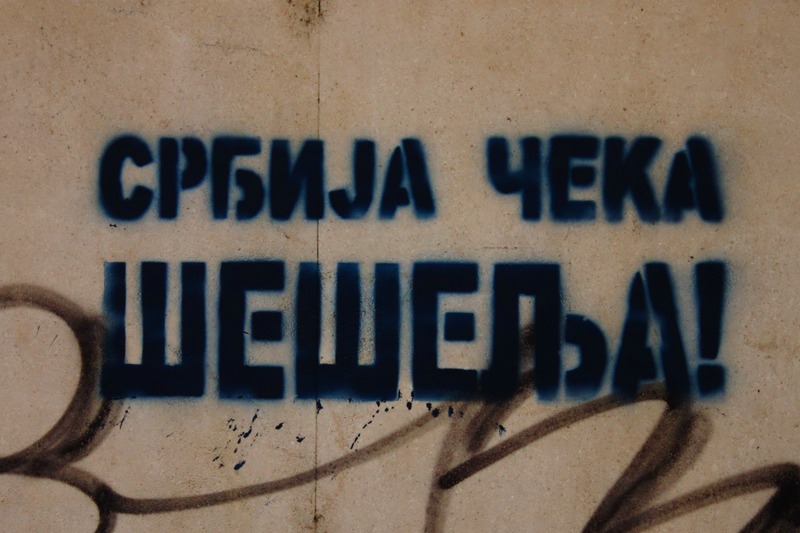 The Higher Public Prosecutor’s Office in Belgrade initiated criminal proceedings against Šešelj over the flag burning. The Croatian Ministry of Foreign and European Affairs sent a fierce protest to the Embassy of Serbia in Zagreb, and recalled its ambassador in Belgrade, Goran Markoti?, for consultations. Vu?i? said that Serbia will not withdraw its ambassador from Zagreb. He added that he will call his Croatian counterpart Zoran Milanovi?, and tell him that the two countries should establish better cooperation. “We will stop negative passions and I will ask members of the Croatian government to show a little more respect for Serbia,” said Vu?i?. Strong verbal exchanges also took place between Aleksandar Vulin, Serbia’s Minister of Labor and Croatian Minister of Veterans’ Affairs, Predrag Mati?. “Go get some medical treatment,” said Mati?, while Vulin responded that Croats “will never be cured of Ustashism”. “Ustaše” or Ustashe were members of the Croatian Revolutionary movement in the period 1929-1945 and are considered an ultra-nationalist and fascist formation. A similar group in Serbia, during the same historic period, was the Chetniks. The fratricidal Yugoslav wars of the 1990s largely revived the historic antagonism between the Chetniks and Ustaše. Serbian Radical Party leader Vojislav Šešelj was indicted for crimes against Croats and Muslims in Croatia, Vojvodina and Bosnia and Herzegovina in the period 1991-93. He had been in ICTY detention since March 24, 2003 when he turned himself in. The trial kicked off in 2007 and the pronouncement of the verdict was scheduled for October 2013, but was postponed because of the exemption of judges. On 12 November 2014 the ICTY released him for humanitarian reasons, so that he may undergo tumor treatment. Although it had not appealed that decision, the ICTY prosecution after Šešelj’s statement that he would not go back to The Hague and others it interpreted as threats to the witnesses and victims, requested that the judges place him back in detention. Serbian and Croatian youth – as all Balkan youth – are very welcome and are participating in EU Youth Exchanges on the topics they are interested in: 100% of the costs for youth hostels, food are covered by the EU Youth in Action program, and about 75% of travel costs. Just google it to find the application forms. Live happy school holidays!